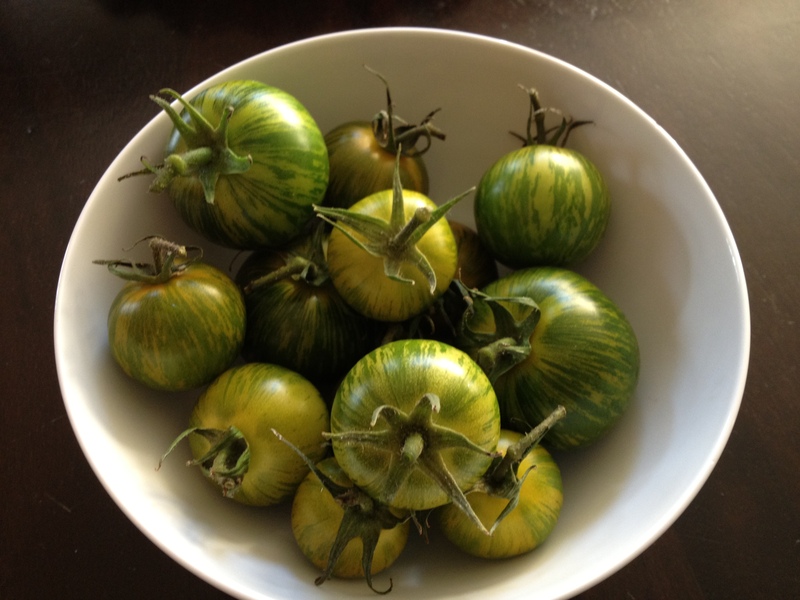 Funny thing about growing tomatoes…you get a lot of them. Then…you gotta use them up! Even when I don’t feel like cooking dinner and I am thinking about picking up take-out from somewhere, I look at the pile of tomatoes in the kitchen and think…I gotta make something with those tomatoes. So for tonight, I figured a pizza would be quick and easy and good for using up a few tomatoes. And there is the fact that I can eat pizza any old time and be pretty darn happy. This dinner is so simple…you don’t even need a recipe! 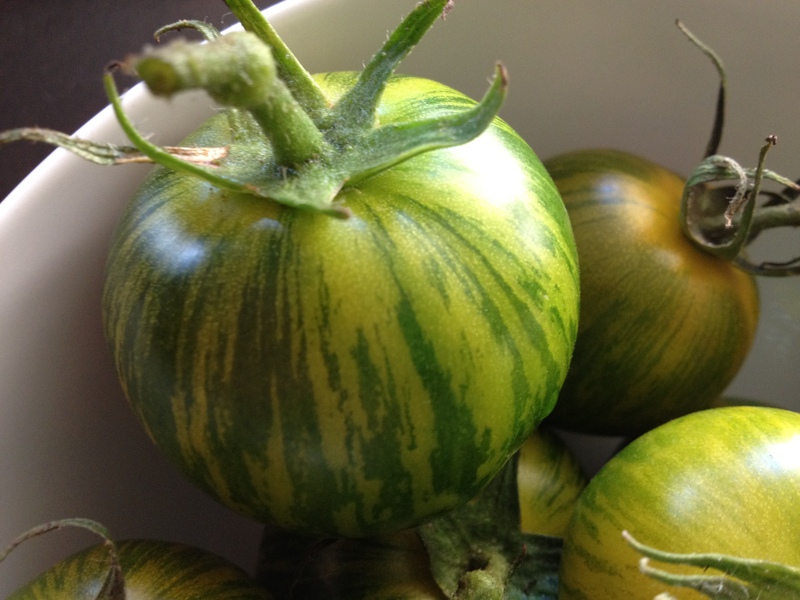 The tomato that we have the most of right now is “Green Zebra”. Check these beauties out! I used a combo of these and the “Druzba” variety that we grew. 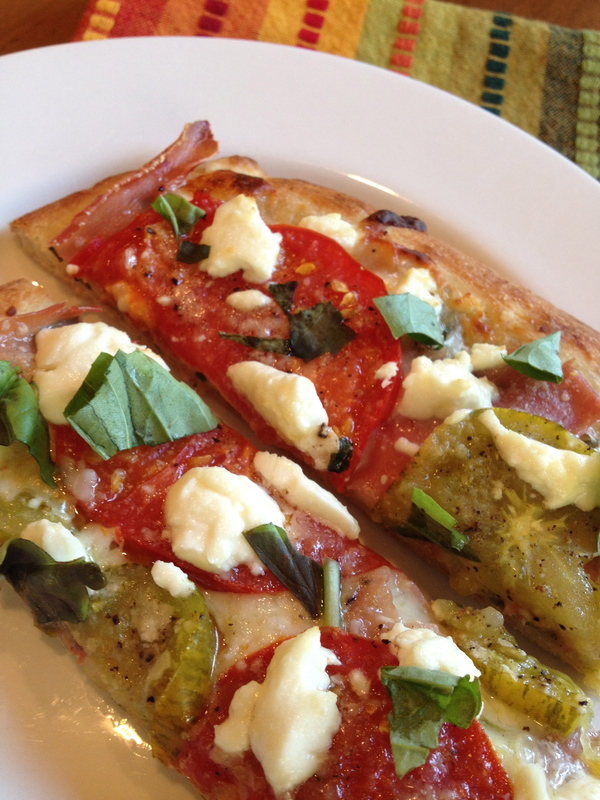 I started with a pre-made crust (I wanted a super quick, effortless dinner!). Next I put a clove of garlic through my trusty garlic press and mixed it with a couple of tablespoons of olive oil. 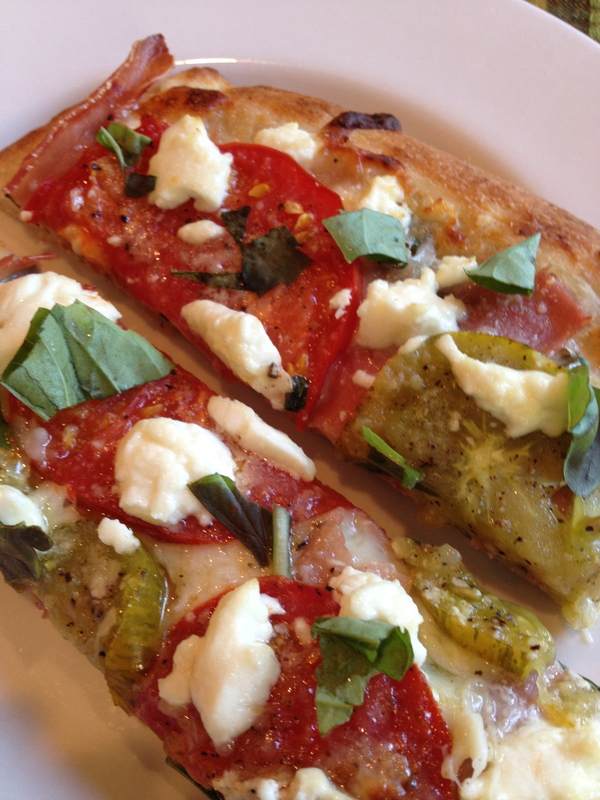 I spread the garlicky-olive oil goodness on the crust, followed by some freshly chopped basil. I topped that with a little shredded mozzarella, prosciutto that I tore into pieces, my sliced heirloom tomatoes, a sprinkle of kosher salt and fresh ground pepper, some dollops of creamy goat cheese, and a sprinkle of grated parmesan. Super simple and OH SO DELICIOUS!! After it came out of the oven, I added a little more freshly torn basil on top. With a fairly large glass of wine, this was a perfect meal! I have bad luck with pizza dough. I have tried TJ’s too and not been able to get it to roll out the way I want it too. I like to use a pre-baked crust and my favorite is Culinary Circle brand from Albertson’s sold in the fresh bread section next to the La Brea bread. It comes in regular and whole wheat. I have also used TJ’s frozen Naan for a quick and easy small crust. Some day I will attempt to make a good crust from scratch, but for now I love how quick & easy pizza night is! BTW…thanks for being my biggest fan!!! !